Dog owners in the digital age have scores of tools available to them. You can now download a free app to your smartphone that will use GPS to record all kinds of statistics as you take your dog on a walk. 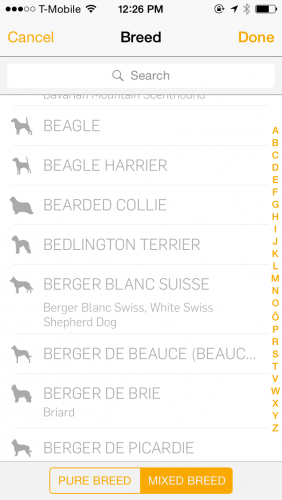 I have checked out a few dog walk tracking apps, and my favorite is Dog Walk by Tractive. This free app records the route, length, and duration of your walks and lets you snap pictures and mark where your furry friend takes care of his business along the way. You can manage multiple pets, and it is super easy to share your finished walks, which makes this app a valuable tool for hired dog walkers who want to send a report to the dogs’ owners. If you cannot get enough of all things canine, check out Life With Dogs, a world leader in dog news and entertainment. Look at adorable pictures, read inspirational rescue stories, and watch clips of the cutest and funniest dogs you have ever seen. Life With Dogs also features articles with great tips for training your dog and helping him live a healthy lifestyle. 1.Download the free Dog Walk app. It is available on Google Play and Apple’s App Store. The app is also compatible with Apple Watch. 2.Launch the app. You will swipe through a few informational pages, and then be asked for your name and email to set up a free account. 3.You will be prompted to enter some information about your pets. You are only required to enter a name, but you can also include a picture from your camera roll. Next, you will be asked which type of pet you have: dog, cat, horse, or other. If you choose dog, then you have the option to enter in the breed. The list is pretty long, but not exhaustive. Try not to sweat it if you cannot find your breed on the list. This step is mostly to distinguish between your pets if you have a lot of them. 4.If you want to add an additional pet, open the menu by tapping the three horizontal bars in the top left corner. Click on Add to be walked through Step 3 again. Add as many pets as you would like. 5.Now it is time to start walking. Open the menu, and click Walk to open up a map. Tap the orange start button. You will be asked which of your pets you are taking with you. Check off the furry friends that are walking with you today, and then press start. The clock starts ticking in the lower right corner, and the distance you have walked will update as you walk along. You will notice three buttons in the upper corner. Tap the first two icons to add a tinkle or poo mark on your map at the location where your furry friend took care of his or her business. The camera button will take you to your camera and mark where on the map the picture was taken. 6.When you are done, hit End. You will be taken to a summary screen that tells you the length and duration of your walk. The pictures you took on the walk will show up here as well. You can share the map and pictures via text message, email, Facebook, or any other sharing apps you have on your device. Dog Walk will send the map and pictures as attachments. 7.Now you go open the menu and view the history of all your past walks. You can sort them by which pets you took for a walk if you have multiple.